The lake was calm as glass on that early September morning as they launched the canoe in the inlet, and pushed out across the lake to the far shore. A light mist rose into the cool morning air giving the distant shore an ethereal and surreal appearance. She sat erect in the bow seat and firmly stroked her paddle as they slid across the glassy surface. From somewhere an eagle called and in the distance another eagle responded back. She rested her paddle across the bow and scanned the shoreline looking for the eagles. The canoe wove in and out among the standing snags of drowned timber along the shoreline as they prospected for eagles. The lake was strangely quiet after the busyness of summer when the air was filled with swallows catching bugs to feed their young, squadrons of baby ducks following their mothers, and the high whistled call of the osprey had often split the stillness. 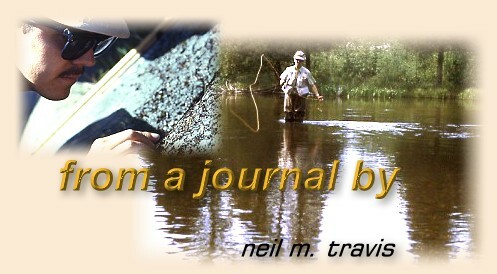 A fly rod rested at the ready in the bottom of the canoe, but even the trout were quiet this morning. Up the draws leading away from the lake the aspens were beginning to show a bit of color; another reminder that summer was quickly fading in the Montana high country. Like the water slipping beneath the bow of their canoe the morning slipped away. They found a couple of eagles nestled back in the pines along the shore, watched a cow moose feeding on water weeds, and laughed as she submerged her huge head to get a mouth full and then stood munching them as water ran in rivulets off her big ears. She turned her head in their direction and they wondered if she thought they were as funny as they thought she was. A small group of white pelicans ascended in lazy circles; riding those invisible currents of rising area higher and higher until they were merely a group of white dots against the azure blue sky. The first breeze ruffled the surface of the lake and they turned the bow toward the inlet. The sparkles on the water reminded her of diamonds. He dropped the electric motor over the stern and they slid down the lake under electric power. She sat in the bow with the wind blowing through her hair, soaking in the sun and the passing scenery. Later she sat on a big log with the sun on her face as he packed up the gear. How she loved this place. 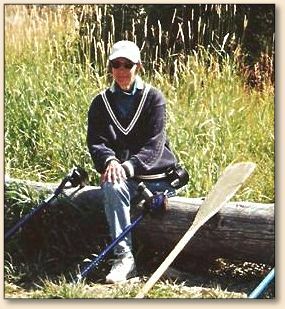 Two crutches rested on the log beside her a reminder that cancer had taken away her leg but not her spirit. With the gear stowed and the canoe loaded atop the Suburban he turned and looked down the lake. It was a ritual that he did each year when he pulled the canoe for the last time. He would stand and soak in the sights, sounds, and smells of the lake for the last time until the next season. In the depths of the long Montana winter those things would sustain him until another spring came around, and if there never was another spring for him, he thought, it would be enough to have had this year. The winter came and went, but the canoe never came out of storage the next summer. The sterile walls of hospital rooms took the place of azure blue skies, and tiled floors replaced the calm surface of the lake. They heard no eagles calling, there were no swallows swooping overhead, no flotillas of baby ducks, no pelicans white against the sky, or a cow moose to make them laugh. When the first cold nights of autumn began to turn the aspens golden yellow in the draws leading away from the lake that she loved, she joined the swallows and flew away.